It’s almost St. Patrick’s Day and I’m part of a virtual St. Patrick’s Day Party! If there was one word to describe the holiday for me, it would be: green. 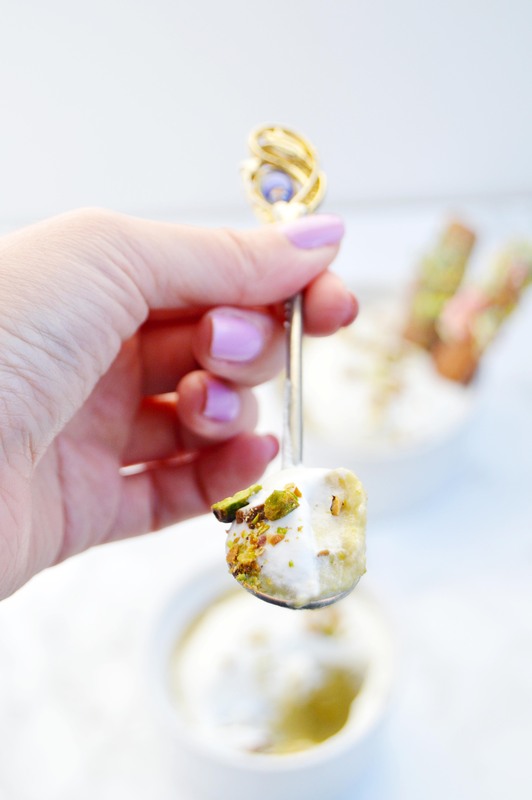 When it comes to desserts there aren’t many green colored options, and I decided to do something with pistachios. I’ve made pistachio flavored cupcakes before but I used jello pudding mix which gave it an artificial taste. I’m not knocking on pistachio pudding mix; I’ve actually grown to like that artificial pistachio flavor. Much like how I’ve grown to love maraschino cherries. The pistachio flavor of the pudding isn’t assertive. If I had to describe the flavor, I would say it’s very similar to the Häagen-Dazs pistachio ice cream only in pudding form, especially once it’s topped with a dollop of whipped cream. It’s dreamy and luscious, and pale green in color. And because I wanted to add lucky charms into the whole thing, I made some lucky charms churros. Funny thing is they look entirely different from now I imagined them. I wanted them to have lots of marshmallows and cereal pieces stuck on them. 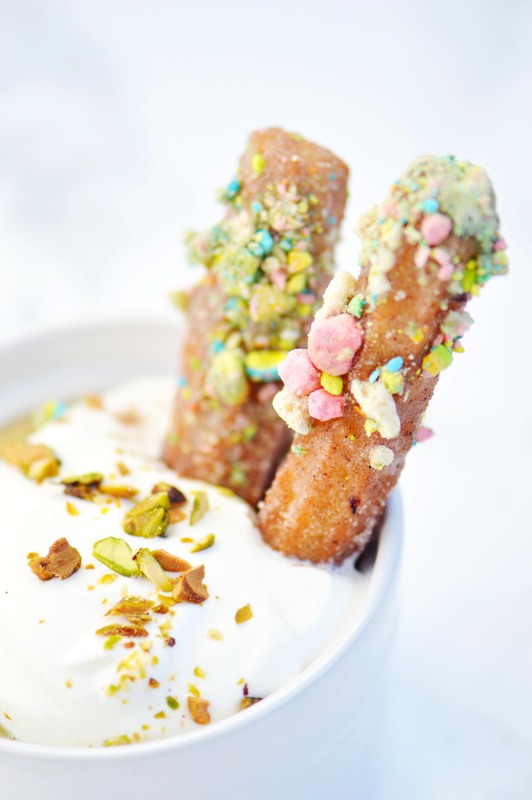 Unfortunately, when I did put whole pieces of the cereal onto the churros, they looked chunky and unappealing. So I crushed them and stuck them on there, similar to sprinkles. A little more whimsical, but it doesn’t really scream “lucky charms”. Oh well. In the bowl of a food processor, pulse pistachios until finely ground. Add sugar and water and continue to blend until smooth. 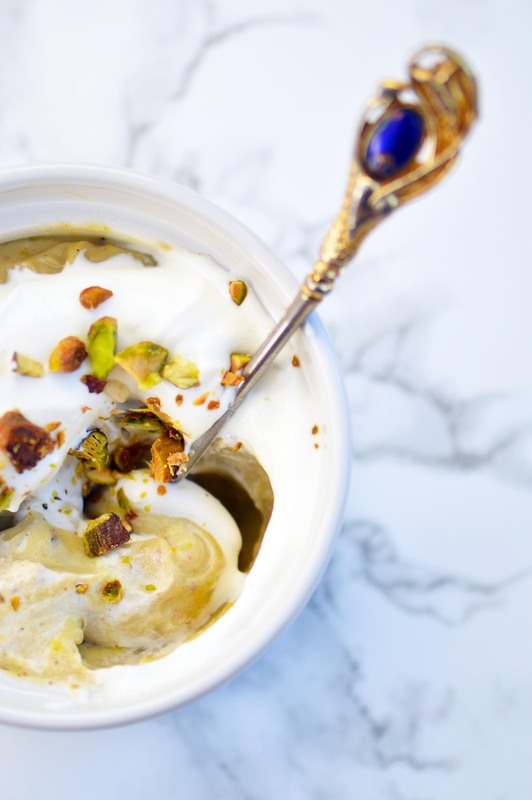 In a small pot, whisk pistachio paste and milk together and heat until simmering. While the pistachio milk comes to a simmer, whisk egg yolks, sugar, cornstarch and salt in a small bowl to form a smooth paste. Slowly whisk in the hot pistachio milk by the ladleful into the egg mixture until you use up half of the pistachio milk. Add the rest of the egg mixture back into the pot and whisk on medium heat until pudding is thickened. Remove pot from heat and whisk in butter and vanilla extract until smooth. Spoon pudding into ramekins, and wrap with plastic wrap and push the plastic onto the surface so it doesn’t form a skin. 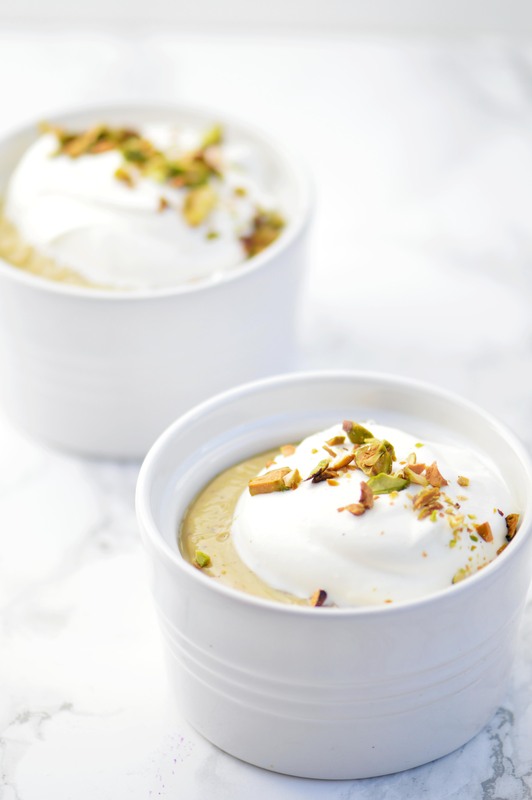 Before serving, whip heavy cream and powdered sugar together until stiff peaks form, place a dollop of whipped cream on top and garnish with chopped pistachios. In a shallow bowl, combine ½ c. sugar and cinnamon and set aside. In a small saucepan over medium heat, whisk water, sugar, 2 tbsp. vegetable oil, and salt together and bring to a boil. Once the mixture is boiling, turn off the heat, add in the flour and stir with a wooden spoon until a ball of dough forms. In a large heavy pot clipped with a candy thermometer, heat the vegetable oil until 375 degrees. While the oil heats, transfer the dough into a piping bag fitted with a large star tip. The dough is dense and tough to push through the piping bag so use a heavy-duty bag. On a sheet pan lined with parchment paper, pipe the length of the churros you would like and cut it off with either a sharp knife or scissors until you use up the dough. Once the oil is heated, slowly place the churro dough into the hot oil. Do not drop the dough into the oil for it will splatter. Place about 3-4 pieces and fry until golden brown, about 2-4 minutes. Lightly shake off the excess oil, and place the cooked churros onto a plate lined with paper towels. Drain churros for two minutes and then toss in the cinnamon sugar. Repeat with the remaining churro dough. Once the churros are cool, drizzle the top half of the churros with the vanilla glaze and dip into the crushed marshmallows. Whisk all three ingredients until smooth. Let stand for a few minutes to thicken. Recipe for the pudding adapted from Joy the Baker. Recipe for churros adapted from Just a Taste. Recipe for glaze adapted from Taste of Home. This entry was posted in cereal, cinnamon, Desserts, Holidays, Nuts, Pistachios, Pudding, st patrick's day and tagged churros, dessert, Desserts, lucky charms, pistachio, Pudding, st patrick's day. Bookmark the permalink. So fun Giselle! What a creative idea for St. Patty’s Day! This is just so fun and well, I’ve never said no to a churro in my whole life 🙂 Happy St. Patrick’s Day! Churros and pudding? Genius! What a fun and tasty St. Patrick’s Day treat that allows the kids and grown-ups to share the fun. So beautiful. Love the pistachio ice cream touch and your description is perfect. I know exactly what to expect. YUM churros and charms? Nailed it! This is one amazing dessert! First, churros!! 🙌 Second, the colors!! I’m loving your photos as well!! You know how much I love pistachios! These are so fun and different and also LUCKY CHARMS. When I was little I was addicted to those and I still go crazy when someone uses them in a grown up recipe! Just clicked over from Ciao chow bambina and so pleased I did! 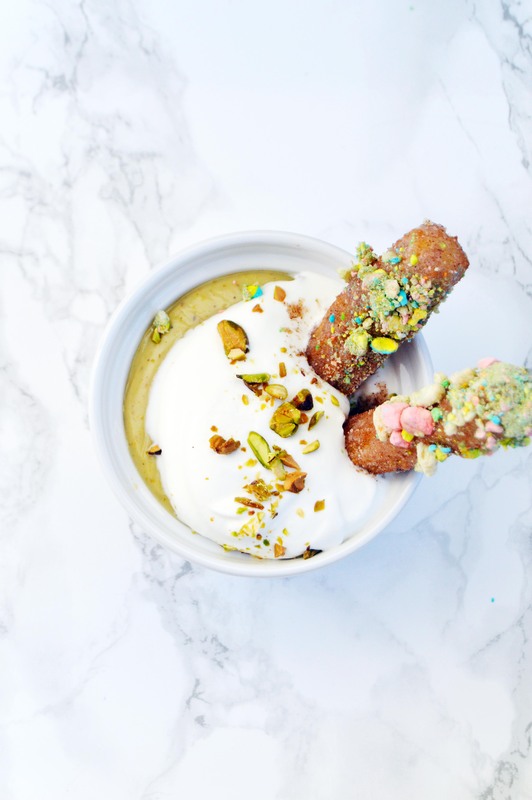 This pistachio pud sounds so yum and the lucky charm churros are so cute!! Wow! 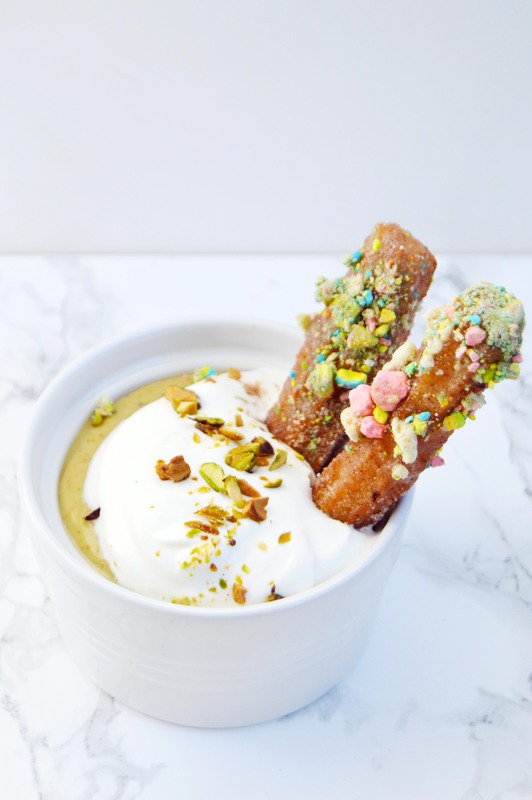 This dessert is so fun, and creative… I love the idea of dipping a churro into a pudding 🙂 Lots of yummy flavors coming together in that bite! Happy St. Patrick’s Day! That happens to me all the time. I have a vision for a food creation in my head and it doesn’t quite come out the way I had envisioned it. I guess it’s all part of the creative process and adapting to ultimately come up with something beautiful. But you know what? While these didn’t come out exactly the way you had originally envisioned them, I still think they are stunning. I love the fun and whimsical colors the Lucky Charms add and I bet those churros are absolute heaven dipped into that pistachio pudding. So creative and absolutely scrumptious! Love this!! I love this! I am a fan of anything pistachio, so this festive take is just wonderful! Mmmm, Pistachios are my favorite!! I’d eat that right up!! Yummy! !